How to detect Virus in computer without Antivirus . 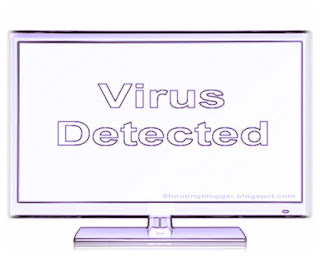 Whenever your computer gets infected by virus , malware , worms or with any kind of harmful program , then computer starts to react Suspiciously by showing some Wired window behavior or Program Window Functioning in minute amount to large amount Its damn easy to find out whether your computer is infected by virus or with harmful , but its a bit Problematic when its come to to detect exact location or virus or Program infected by Virus , Although its Tough to Find out exact Virus Program but its not even impossible .To Spot or detect a Virus or harmful program in computer is easy Through keen observation over your computer programs , Behavior , Performance . What computer virus do ? Computer Virus is a kind of program are designed to loaded onto Computer for the sake of reducing computer efficiency , Stealing data , dumping Memory like Hard disk space , Ram Memory etc . How do i know My computer is infected by Virus ? Its easy to detect whether your computer is safe or being infected by virus , Whenever your computer Operating system is infected or attacked by virus ( Any kind of harmful program ) , Your computer starts to show some Sign like Lagging computer program performance , Loading of program takes time , Programs Get suspiciously unresponsive programs etc . Primary Memory Dumping virus - Track Your memory or process Usage . A Virus that Harm or dump Ram memory can be easily Detected via Task manager . These types of virus loads up in programs memories and Dumps a part of Ram memory for there Program execution and reduce free ram for proper functioning .To detect a Virus infected program in your computer , Open task manager by pressing CTRL+ ALT + delete , Spot for a Small size program or process that uses High Memory like 2 Mb of xyz program using 50 Mb + memory . Secondary Memory Dumping virus - Track Your Hard disk Usage . There are Thousands of virus which are just programmed for dumping computers hard disk with copies of same File or Virus due to which a large part of hard disk space is wasted .These type of Virus Creates backup in almost every Folder or your computers . These virus create folders or file with same name so there are easy to detect but hard to remove without antivirus programs . To see whether your Pc is infected by virus that dump hard disk is easy ,these kind of virus set there attribute to hidden so by enabling Hidden Folder you can detect these virus programs. Most dangerous virus programs is the virus that use internet connection to steal or transfer data without knowledge of a person . These type of virus programs are designed to steal Personal data like log in credentials etc . Although virus that use internet is dangerous but its damn easy to detect these kind of Virus only you need to keep a keen observation in sent and received data while idle internet connection. Close all internet programs and updates and See whether your internet connection is Sending and receiving data continuously then your computer is infected By Virus program that Aims to steams data .